The Essential Laptop Bag from V7 is the perfect choice for an economical, stylish laptop carrier. The clean, modern design of the bag is simple yet refined, plus it has a detachable shoulder strap and is lightweight, making it easy to carry wherever you go. The Essential Laptop Bag features solid construction, so you can be sure it will protect your laptop while youâ€™re travelling. The bag also features a handy Velcro-secured outside pocket to store your accessories and an inside pocket to store documents and files. For students and professionals alike, the Essential Laptop Bag from V7 is a simple way to transport your laptop in style. 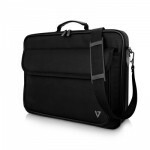 - Main compartment fits laptop up to 16"